The Neopian Times Week 47 > Short Stories > Whatever Happened to Evelayna? The morning was ever so much the same as it was every morning. The typical routine, waking up at seven, getting dressed and going down to eat breakfast. This June morning was unlike any other, my mother called for me to come eat and I did so. She never would dare to think of letting me starve before she set out to do her morning shopping around the Neopian markets. "Evie!" she called, "Come down, I'm about to leave but I've made some delicious hot cakes for you." "Yes, mother," was my reply. As mother went out the door, I stood by my dresser staring at the window as she met with her other Neopian friends and set out to do their shopping. I quickly powdered my nose and fluffed my tail, seeing as how my being an Usul requires much grooming. As I lightly paraded my way down the stairs the air smelled like moist hot cakes and sweet syrup, my mouth was watering to eat something. The hallway was filled completely with the aromas of mother's delicate perfume and those hot cakes. When I entered the kitchen, I immediately began to eat the delicious breakfast mother had cooked for me. Yes, indeed, today was as any other day. Just when I had finished up the last bite of breakfast, the doorbell rang. "I wonder who that could be when it's so early in the morning," I whispered under my breath. I opened the door to find my next door neighbour and very good friend Kaucaisia the cloud Kau. She had wild excitement in her eyes as she spoke intensely, "Evelayna, you'll never guess what I just found in the woods!" Her excitement soared as she babbled on, "Well, I was walking, like any other morning, waiting until mother came back from her daily routine, and I saw this shiny thing sticking up from the ground. I went over to see what it was just out of curiosity, and it uncovered this huge machine. I know I shouldn't have but I did!" "Did what!?" I asked feeling hot with anticipation. "OK, well I went inside it! I had no idea what it was and then as soon as I went in through the door, I saw the lights and the dates, Evelayna! I've found a time machine!" "A time machine! May I see it, Oh! Please take me to see it Kaucasia!" We ran almost lightening fast; we could have beaten all the Poogles at the Poogle Races. When we arrived, I saw what she had described, a huge metal machine, with big red, blue and green dials, and lights flashing with all the colours of the rainbow pool. Kaucasia stepped inside first, and I followed her. The dates ran horizontally starting from the year 1200 and ending with the year 4000. "Ever wondered what it would be like to time travel?" Kaucasia whispered lowly, a slight smile appearing on her face. "Kaucasia, do you think we could pull it off? I mean, we don't even know who this belongs to, let alone how to work it!" "We're smart, I'm sure it couldn't be that hard, after all, this is time travel we're talking about!" I paused for a moment, about to say 'no,' but my interest and my adventurous side of me pulled me to blurting out, "Okay, let's go for it!" "Hmm," Kaucasia pondered, "In those old movies we watch, you always see a big red button for ignition." We looked about for a minute when she said, "Ah, I found it!" She pushed the button and the machine gave out a loud roar, then all was quiet. Suddenly, the machine jolted violently back and forth, I thought my head was going to explode! The roar of the engine came back and I could tell the machine was ready for takeoff. But, with all the commotion, I slipped back and fell on one of the dates, which date it was I was uncertain. I was thrown to the floor immediately where Kaucasia soon followed. We were traveling through time, knowing not where our destination was. As the machine jolted around in every direction, the lights flashed and bells rang into our ears. I thought my body was being pulled out of its joints. Kaucasia must have felt the same because she kept screaming in horror, as I was too. Then, suddenly, everything stopped. The machine was as quiet as when we first stepped inside it, the lights stabilised, and the ringing in my ears ceased. We had landed. Shaking with fright, I looked at Kaucasia and said, "Do you think we have landed? Is it safe to open the door?" "I don't know," she said, with the same uneasy tone in her voice. We decided to wait a while before opening the door just in case. Finally, we got up the courage to unlock the door and force it open. It made a slight creaking noise, and then it swung wide to unveil our destination. The smell of the air was unlike any I had smelled before, like I smelled every type of flower in all of Neopia at once. Kaucasia noticed it also; she pointed out how the plants were very thick and how you couldn't see our houses anymore. In fact, there were no buildings in sight! All around us was green marsh and the flowers seemed to be bigger than Kaucasia and I put together. The sight was breathtaking. Luscious forest, marsh, flowers of all colours, and sweet air. I wondered to myself about what year we were in, if it was the future, surely there would be buildings to see. This could only mean we were in the past. "Kaucasia, do you suppose we've gone back in time? To Ancient Neopia?" "I think we need to check it out, but first we must cover up the machine so no one finds it." She was a good thinker, I would have forgotten completely about the machine; I was too busy pondering on whether this was past or present. Kaucasia and I walked through the maze of greenery for at least twenty minutes with no sign of life anywhere. I thought for a moment on if we could have gone back in time too far, but no, the time machine only went to the year 1200, and I remember my teacher lecturing about the old Neopian Tribes that lived in Tyrannia around the year 1000. We walked for another twenty minutes when we saw a hut. Not quite a house, but a hut made out of shrubs. "Do you think we should go look inside?" I asked. "Maybe we should knock," was Kaucasia's reply. "What do we tell them? That we landed here from the future with a time machine?" "Evie, we simply try and communicate and find out what time we're in, and look about. It's not like we're planning on staying here." With that, we went up to the house and knocked on the door. An old Green Scorchio stepped out and said, "Go away!" "Hello, there! Can you help us? We seem to have gotten lost and don't know where we are. Could you give us directions to the local town?" I asked. "Who are you? Know one comes out to these woods, the ghosts come around this time of day. I don't want to be bothered, you interrupted my reading." "Sir," Kaucasia said, "we don't know the way to the city and we'd appreciate it if you'd spare just five minutes of your time for directions. My friend and I aren't from here and we'd like to talk to you for just a moment." The old Scorchio looked around for a minute, then exhaled powerfully. "You kids may be in danger if you stand out there, come in. Don't stand there, come!" We did as we were told and followed him inside, unsure of why he was so frightful of us being outside. "My name is Scorchy the Scorchio. I've lived in this very hut for fifteen years. I used to live in the city, but they started to 'modernise' it. Using money and setting up trade systems, Phah! They can have it! I'd rather live out in the peaceful woods. Sure, there are ghosts, but as long as I'm indoors, they don't bother me. So, where are you two girls from? Not around here, you said? I can tell, you talk funny and you wear strange garments. No doubt you're from the modernise city across the Neopian Ocean? Who are you now?" "My name is Evelayna, and this is my good friend Kaucasia. We were wandering about and got lost. All we wanted was to stop by and ask where we are and where the city is." "Ah, wanderer's, eh? Well, no trouble there, you're in Neotasia, founded in 1050 by my ancestor, Scorchester. The city is only a five quaddel walk from here. But beware of ghosts, gruesome things that steal your money!" Scorchy laughed until smoke leaked through his nostrils and he said, "You girls aren't really from here. A quaddel is the distance five quaddels and yes ghosts haunt these forests in search of money. Little thieves." "So, the city isn't far from here?" asked Kaucasia. "No, I should say not, I go there from time to time to get me some food from the street markets and to get me some books to read. All you do is follow the widest trail until you see the wood carvings of the Neotasia banner." "Well, we must be off, sorry to keep you from your book Mr. Scorchy, it was very nice meeting you!" I said. Kaucasia and I headed off after we left Mr. Scorchy's house. We were full of excitement, because it's not everyday you go to a whole other dimension in time. Her and I were going sightseeing; we could make an awesome history project out of this for Miss Wocky's class. As we were walking I thought I heard noises, I turned behind me to see no one there. Kaucasia heard it too, she turned around once to find the same thing as I: nothing. How peculiar it was, to hear something unusual and find nothing there. Then, out of the blue, a ghost went swarming into sight and nearly knocked me down. I screamed as it dived down again, this time succeeding to knock me to my feet. Kaucasia pulled me up quickly and we dived into some nearby bushes. The ghost cackled hideously and glided away. "That was a... a... a... ghost!" I shrieked. "I thought you were done for, Evie!" We started walking a bit nervously, watching out for more ghosts. Fortunately, we had no further trouble with them, and before long, I saw the wooden carving that read "Neotasia" in wide letters. We had reached the city at last. The city was enormous to me. The sight made my jaw drop immediately. Kaucasia was wishing she had her camera with her. 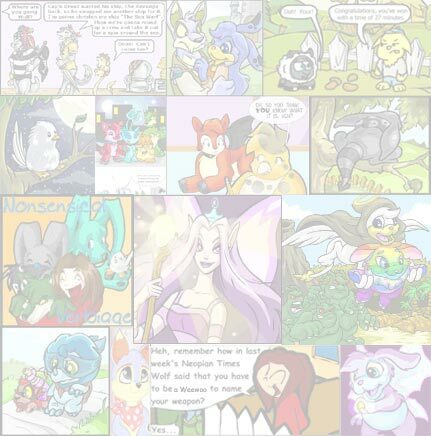 Neopets I had never seen before were out on the dirt roads trading and buying. It looked normal and different at the same time. Little huts surrounded the market, to where the city had a distinct shape of an arch. The huts were not made of shrubs, but of wood and straw. The Neopians didn't seem to mind us; they were all too busy shopping around. "What kind of money do they use? Suppose it's anything like our Neopoint currency?" asked Kaucasia. I thought for a moment, then answered, "Let's go find out." We walked all through the market; we went by cloth booths, painting booths, food stands, and jewelry booths. The money they use is entirely different! They use a certain type of leaf is all I could see. We decided to go ask the Nimmo at the painting booth just what kind of currency they used. "Hello Sir, my friend and I are from overseas and are not familiar with your particular money. Would you mind telling us exactly what you use?" I asked. "Why, certainly!" the Nimmo yelped with sudden glee than he could be of help. "We use a certain type of leaf that grown in everyone's backyard. But, see here's the catch, the wealthy merchants have more of the plant in their backyards than the poorer ones who might only have two plants. The wealthy ones might have fifty plants. So we use those leaves to use as money." This seems rather odd to Kaucasia and I both. We have never heard of anyone using leaves for money before. Therefore Kaucasia asked, "So, how do you price things here?" "You see, we have items for half a Shindar, a Shindar is the leaf. There are items for twenty Shindars. That's how we price it, the more Shindars, the more expensive an item is." "Oh," I said, "Well, thank you for your help!" It was past noontime for our shadows were very long and some people had started to leave to go home into their huts for dinnertime. The thought of dinner made my stomach growl. Kaucasia was equally exhausted and we both knew it was time to be heading home. We made our way back onto the trail that first led us to the city and past the old Scorchio's hut. The sun was setting quickly so we sped up our pace. Darkness was upon us and the trail became harder to follow. Though the darkness had come, Kaucasia and I saw the machine. We uncovered it from the greenery we put on it, and swung open the large door. Since the sun was already down we couldn't see the inside at all. We needed light to see which dials led to where. I couldn't even tell where the ignition button was. "Kaucasia, can you see anything?" I asked. "How are we ever going to get back when we can't see the dials to put it on the correct date?" I screamed with sheer impatience. "Calm down, Evie. I'm sure we'll do something." She touched a button and the engine gave a loud roar, then quieted; like when we first took off. But, this time it was different, it wouldn't start up again. Something was terribly wrong. Neither of us knew what, we could barely see each other, let alone see what was going on. I tripped as I walked over and fell and just happened to hit a switch. The switch did nothing at first, then it sparked and the whole machine lit up. "I guess I found the light switch, Kaucasia," I humoured. She laughed for a moment, then said, "I don't know what's wrong, I know I hit the right button!" "Are you sure? I mean the lights weren't even turned on yet, you could have hit another one by accident?" "I'm almost positive, Evie! Here, I'll press it again." She pressed it and sure enough the engine roared fiercely and then stopped abruptly. I knew it then that something was wrong. What it was remained a mystery. All I knew what that I was hungry and I was getting homesick, for I'm sure mother was calling up the Neopolice to look for Kaucasia and I. I wanted to cry, but pride stopped me. I was determined to figure out what was wrong with the time machine. Kaucasia opened the door to find a pitch black outside, and the sweet smell of the flowers gone. She signal me to take her tail and follow close behind her while we tried to adjust our eyes to the darkness to see if the machine was broken. At that moment, a ghost popped out at grabbed hold of Kaucasia sending her sliding across the ground. The ghosts didn't go away after all, they had followed us all day. They wanted our money and they stole a piece of our ship, the igniters, just so we couldn't leave. I panicked and began to pick us branches and stick to throw at the ghouls. There were about ten of then swarming around me. I ran over to where Kaucasia was lying, "Kaucasia! Answer me! Wake up, come on, wake up. The ghosts have our igniters!" She roused some but wasn't able to get up yet. The ghosts had backed off, which was odd. Then I heard footsteps; someone was walking towards us. They were walking very slowly and very heavily. I couldn't see anyone and my heart was racing. A creature laughed and I looked up to make out a Scorchio. It was that man we had met earlier in the day, Mr. Scorchy. "I knew you two weren't from here! You're from the future; the ghosts told me you had a machine with you. Yes, the ghost's work for me, don't look surprised. They steal Shindars from people and bring them to me. 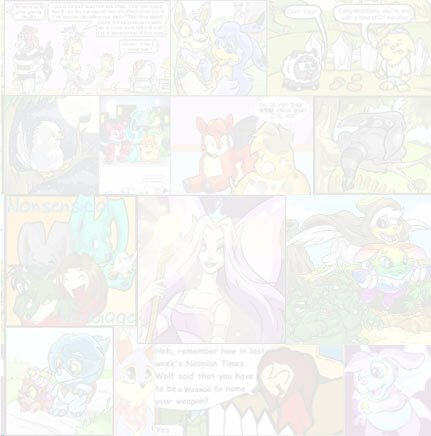 I could be the richest Neopet of Neotasia if I could time travel. You wonder why I didn't just steal it form you while you were gone? That's because I have no idea how to work the machine, and you girls will help me!" I thought this Scorchio was crazy, absolutely out of his mind. "Why would you do something like that? Steal from people? You are heartless, no one could be that cruel to Neopets, no matter if you're from the future or past!" "Well, see, it's a plan that was passed down to me from my grand Neopets. To rule Neotasia one day. It's absolutely brilliant, and with a time machine, I can change the past and make everything how I want it to be!" As I argued with Mr. Scorchio, Kaucasia had slipped into the darkness, and was secretly searching for the igniters. She heard the conversation and I knew that she was going to his house to find them, even though she never said anything. I was just praying no ghost got hold of her. Mr. Scorchy and I bickered for about ten minutes when I heard a roar. A powerful roar, so loud that I thought I was going to go deaf. Then, all was quiet. I immediately sprang up to see that Kaucasia was in the machine and had found the igniters! Mr. Scorchy grabbed my tail and pulled me behind while we ran towards the machine. I bounced with all my might within me; I struggled to beat him there. Kaucasia was yelling, "Hurry Evie, Hurry." Time suspended for a moment and the next thing I remember is bouncing so high that I flew over Mr. Scorchy's head and landed safe within the time machine. Kaucasia hit the year for 2002 and the machine once again rocked so hard that I was knocked to the ground, breathless. When the roaring and the shaking stopped, I knew we were home. I flung open the door to find us at home, in the very same woods where we first uncovered the machine. No strange smells and the houses were in plain sight. It was still daylight, which seemed odd. Kaucasia and I stepped out of the machine and raced home. We looked at the clock, we had only been gone an hour. Flower and fruit prints were always a big hit, and-more importantly than that--presents were given out.